I can’t count the number of times I’ve seen someone work hard on an ambitious presentation, test it all out, copy it to a laptop, and then have it fail when presenting. The reason is usually that the the presentation has become huge and the laptop isn’t fast enough or doesn’t have enough memory to handle it. The first message is: Always test your presentation on the computer that you’ll be presenting from. Reduce the size of the image. You can do this in PowerPoint, but you’ll have more options in an image editing program. In Adobe Photoshop, choose Image > Image Size. If you want the image to be the size of a typical slide, change the width to 10, with the Constrain Proportions check box checked. In many cases (such as a photo from a digital camera), the height will change to 7.5, just what you want to cover the slide. Crop the image. In PowerPoint 2007, 2010, and 2013, go to Format tab> Size group> Crop. In PowerPoint 2003, select the image and choose Crop on the Picture toolbar. Compress the image. (n PowerPoint 2007, 2010, and 2013, go to Format tab> Adjust group> Compress Pictures, and click the Options button. Click OK. In PowerPoint 2003, select any image to display the Picture toolbar. Click the Compress Pictures button. In the Compress Pictures dialog box, compress the selected image or all images, choose a resolution (use Web/Screen for the smallest size), and also choose to delete the cropped area of images — so you can’t restore the image to its original size. In all versions, then save the presentation under a new name — just in case you don’t like the results. I took a PowerPoint presentation with one BMP file and reduced it from 4,561 KB to 831 KB this way. Reduce quality (JPEG images). In Photoshop, choose File> Save As and choose JPEG as the file type. Then you can use the Quality text box or drop-down list. In Photoshop, choose File > Save For Web. By choosing Medium, I changed my photo from 41 KB to 15 KB! Convert embedded graphics to PowerPoint objects. If you used Insert> Object to embed an object, it’s hard to tell what may be in that image (or charts or spreadsheet). Try to ungroup it (right-click it and choose Grouping> Ungroup). Then regroup it again. Note that you won’t be able to edit the object with the original program, so save the presentation under a different file name, just in case. Don’t copy and paste, or drag ‘n drop, images into a presentation. Instead, save them as a separate file and insert them as a picture. If necessary, you can copy and paste into an image editing program and save the image there before inserting it into PowerPoint. Save the file under a new name. PowerPoint remembers all your actions in a session so that you can undo them. Saving under another name discards this information. For some reason, this works better than closing and opening the same file. Disable fast saves. This feature increases file size. Choose Tools > Options. On the Save tab, deselect the Allow Fast Saves check box. Don’t save in PowerPoint 95 compatible format — it’s much larger. pptMinimizer, by Balesio. This also works with Word and Excel files. NXPowerLite. This also works with Word and Excel files. Thank you very much! Very usefull this information…I always had many problems because of this which ended up files being way to big to send. Cropping them definitely saves some space.Im not the brightest on these type of things. I just made a PowerPoint 2007 slide show presentation with 82 slides, music (that plays through the slides from beginning to ending) and many slides having animated GIFS. The complete finished presentation is flawless, and it came out very well. It’s really a beautiful presentation (for a retirement party). I saved the presentation on my desktop, and if I click the PowerPoint icon for this, of course it goes into the slide presentation where I can edit any number of slides I so desire or modify it in any way. NOW! No matter what I do to transfer this file . . . saving it to a CD or flash drive . . . or, even put the file into a New Folder from the desktop, the animated GIFS not only get “flattened” and don’t play AT ALL . . . but the ENTIRE SLIDE PRESENTATION doesn’t even advance from Slide One!!! Also, the music background is gone! So in other words, if I click the icon from any saved media – CD, flash drive, it shows the very first slide only and just “sits” there – no music, no animated GIF (which I have starting on the first slide) and no advancement from this first slide into Slide Two! TALK ABOUT AN ODDITY! Can anyone offer any help on this? This is going to solve at least part of your problem, the GIFs not working. The music is probably gone because you didn’t bring the music file to the CD or Flash drive. Unless the music is a WAV file, you can’t embed it, only link to it. If the music file wasn’t in the same folder as the PowerPoint file, you’ll need to start from scratch–move it to the save folder and re-insert it. Otherwise, just make sure that you move the music file with the PowerPoint file. Regarding why the slide presentation doesn’t advance, I’m not sure–I’d have to see it, but I would guess that it’s related to the music file. Open the Animation Pane and check the order of the animation. Inserted sound adds an animation event, although many people don’t realize it, so inserting music can stop other animation from happening. That was HUGE help! I reduced my 8 page powerpoint presentation from 12MB to 3.37. Thanks! you should adapt your photos to the resolution of the projector! so instead of random dropping large picturefiles to your presentation, first adapt the resolution (eg 1024×768) then save as jpeg (high quality) and you should immediately save a lot of space. How do you change the resolution of your photos? Do you use Photoshop? What should people use who don’t have Photoshop? you can resize your photos with all kinds of freeware…. Also you can try http://www.imagesizereducer.com online image edit tool. For the image size reducer (www.imagesizereducer.com) if the images are mine ( hi-res scans from my collection of antique family photos ) should I worry about them being saved by that website and used somewhere else ? Out of all the places on the web (including the Microsoft website) this is the only place that helped me compress the images in my presentation. Every other site directed me to the wrong area of the program (under File) THANK YOU for helping me take an 80 MB presentation and making it 34 MB!!! Glad to help! If you haven’t subscribed to my PowerPoint Tips Newsletter, I invite you to do so. 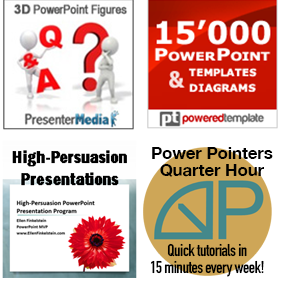 I regularly send out great tips that will help you in all areas of presenting and PowerPoint. Here’s the link: http://www.ellenfinkelstein.com/ppt_submit.html. Check also the MASTERslide, in my case big size graphics (700k in my company…)are saved there. Thank you for the most useful article on the topic! I see a puzzling effect, where if I attach my 8 MB presentation to an email, that simple step makes it a 10.5 MB file. When I save that emailed file to disk, it is again 8 MB. What is going on here? Has anyone solved this? Also, the file jumped from being a 5 MB file to an 8 MB file quite quickly, so I am wondering if it attached some referenced file or similar, but I don´t see anything like that and there are no alerts or messages. How to check if maybe my Powerpoint is attaching for example the Excel file originating the data? I’m having a hard time saving my slide show(pictures around 500) How can I save it? @Rosie – quick answer is: files on your computer are stored in binary (more efficient). Email is transmitted as text (less efficient). As such, re-encoding the binary data (PPT) as text makes it larger, because the efficient data is being represented in a less efficient way. And that’s pretty much true for any email attachment. Also, I think it’s important to mention that using PowerPoint’s compress feature will noticeably degrade the quality of the photos in your presentation. As such, professional presentation designers who need to project the finished deck for large audiences–at conferences, for example–don’t use it. And if you’re working with an agency and decide to compress a deck sent to you by them, you’ve increased your cost by hundreds of dollars (depending on the length of the presentation) because they now need to go back in and replace all the photos you’ve degraded. But don’t take my word for it. Insert a photo with small text on it–like a website mockup–on two consecutive slides in the same deck. Then, reduce the size of the second only, using PowerPoint’s compress feature but not applying to all photos. Run the presentation in show mode. If you’re not seeing a difference, then maybe the quality loss isn’t important enough for you or your audience. But on anything larger than a 12″ laptop screen, it should be pretty apparent. Dave, I think that designers notice this more. I just took a screenshot of your comment — all small text — and put it on 2 slides. I compressed the 2nd one to 96dpi (it was the only option available), which would normally be very low. I can’t tell the difference on my 23-inch monitor. But I definitely agree that you should check the results before and after if there’s any detail in the image to make sure it’s OK.
Hi Ellen, not contradicting you but I’d like you to take the same screenshot and size it down to 60%. Then leave one untouched and compress the other. You should immediately see that the compressed version is almost illegible. Larger text/logos/graphics won’t be as noticeable. It’s when the images get smaller with the greater need for detail, that you’ll see the difference.